The coming of the Messiah was promised by the Old Testament and the Jews were waiting for him. Therefore, when a strange man, who lived in the desert, who bore the simple clothing of camel's hair and ate what he could find amidst the stones, called men to God - many took him for the Savior of the World. He urged the Jews to repent, to get cleansed of sins via a ritual bath in the Jordan River. This man was John the Baptist. But he certainly was not the Savior - he was the last of the Old Testament prophets, whom God sent to earth to warn mankind that the Savior is about to come, that he was already born and walks on this sinful earth. Naturally, John himself was aware of this. He was also called the Forerunner because he came to preach before ("ahead of") Christ and was preparing the way for Him as the predecessor or the precursor. Therefore, when Christ came to him and asked him to baptize him in the waters of the Jordan, John was surprised: "I need to be baptized of thee, and comest thou to me?" To which Jesus replied: "for thus it becometh us to fulfill all righteousness" (Matthew. 3:15). In the sense that God, through the prophets of the Old Testament, has provided exactly this order of the coming of His Son to the people. John baptized Jesus … and then, as the Evangelist Luke says further, "the heaven was opened, and the Holy Spirit descended on him in bodily form like a dove, and a voice came from heaven, which said, Thou art my beloved Son; in thee I am well pleased!" So God clearly and unambiguously told people - and there were many gathered near John at the Jordan River - that the Savior had already come, and more than that, that He was there with them. Baptism - is the first event in the public life of Christ. About how he lived and what he did before the baptism in the Jordan river, almost nothing is known to us. (According to tradition, Jesus was a carpenter - but it's just a legend, based on the fact that his foster father, St. Joseph, was a carpenter). However, the baptism in the river Jordan became the starting point from which, by and large, started the whole Gospel story, our Church and our Faith. Indeed, right after that, literally on the very next day, the very first of his disciples joined Christ. “Again, the next day, John stood with two of his disciples. And looking at Jesus as He walked, he said, ‘Behold the Lamb of God!’ The two disciples heard him speak, and they followed Jesus.” - says John the Evangelist. "The two disciples" - this is the Apostle Andrew the First-Called, named so precisely because he was the first who went with Jesus Christ, and his brother, Simon, whom Jesus called Peter. The word about Christ immediately spread out through the Palestine. "... A great prophet has arisen among us and God has visited his people. Such an opinion about Him spread throughout Judea and all the region "- says the Evangelist Luke. And there were more and more disciples of Christ every day. And Jesus went into the desert - He had to be alone to prepare for the execution of the mission for which He came to earth ... In the desert for forty days Jesus was "tempted of the devil and in those days he did eat nothing" (Luke 4: 2). The Devil and his henchmen are fighting for the soul of each of us, but it's hard to imagine - how fiercely they fought for his soul ... "And the devil said unto him, If thou be the Son of God, command this stone that it be made bread. And Jesus answering said unto him, It is written, that man shall not live by bread alone, but by every word of God. And, taking him up into an high mountain, the devil showed him all the kingdoms of the world in a moment of time, and the devil said unto him: all this power will I give thee, and the glory of them: for that is delivered unto me, and to whomsoever I will give it; If thou therefore wilt worship me, all will be thine. Jesus answering said unto him, Get thee behind me, Satan; for it is written, Thou worship the Lord thy God, and him only shalt thou serve. And led him to Jerusalem, and set him on a pinnacle of the temple, and said unto him, If thou be the Son of God, cast thyself down from hence, for it is written He shall give his angels charge over thee, to keep thee; and in their hands they shall bear thee up, lest at any time thou dash thy foot against a stone. And Jesus answering said unto him: It is said, Thou shalt not tempt the Lord thy God. And when devil had ended all the temptation, the devil departed from him for a season "(Luke 4:3-13). For simplicity, what happened at the Jordan River, we call baptism. Although, of course, what kind of baptism without Christ, his crucifixion and ascension into heaven? It was well understood by John the Baptist himself. He said: "I baptize you with water unto repentance: but he that cometh after me is mightier than I, I am not worthy to carry his sandals; He will baptize you with the Holy Spirit and with fire "(Matthew 3:11). That is, baptism by John is the baptism of repentance, in other words the preliminary baptism. After all, without sincere repentance the path into the kingdom of heaven is closed for people. But without the Holy Spirit there is no real Christian baptism at all. 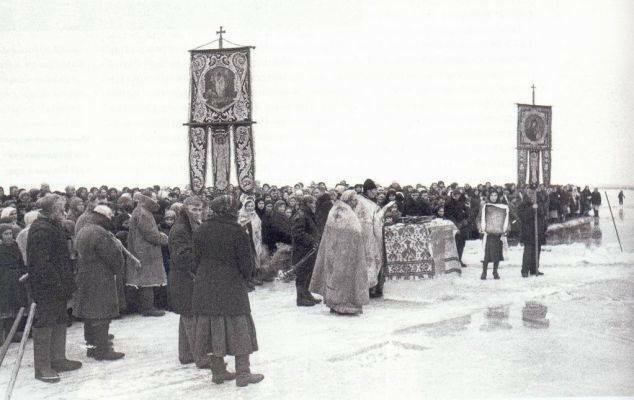 The Sacrament of Holy Baptism in the Orthodox Church is almost exactly the same as what happened two thousand years ago at the Jordan River, at least in appearance. Christ, Who fully possessed all His Divinity, deigned to show us the way by accepting the baptism of John and thereby sanctified and gave power to the waters of baptism. When we are baptized, we are immersed in the water, renouncing the devil and uniting ourselves to Christ, the ‘old man’ is washed away and we come up out of the waters as a ‘new man’ – a Christian who pledges fidelity to Christ. War or no war, but life is impossible without holy water. 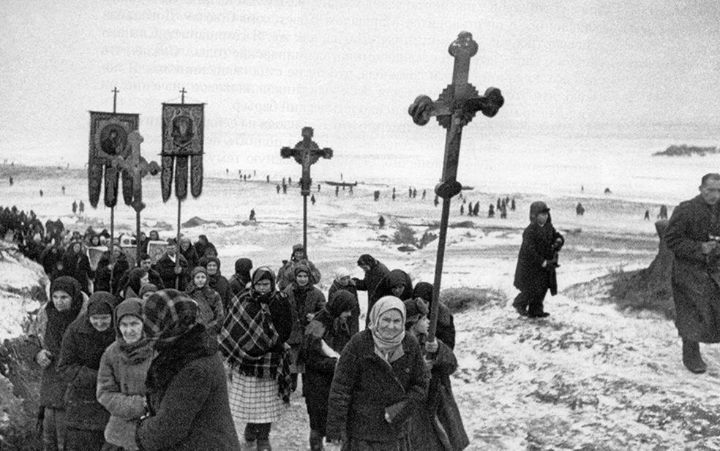 ... and procession of Christians from the Lotzkamenka village (Ukraine) during World War II. 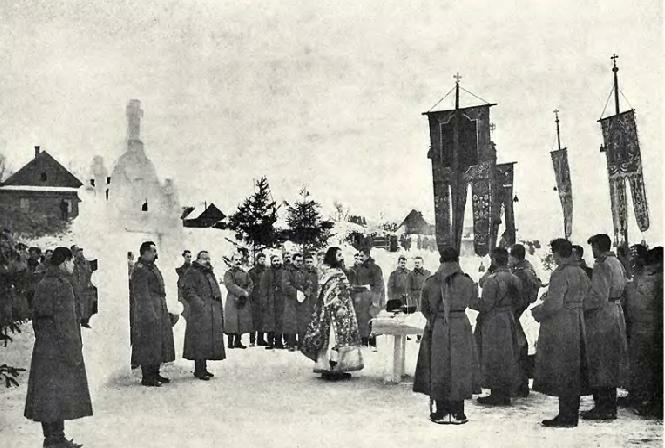 Blessing of Waters during the World War I.